Renowned worldwide as the most trustworthy source of privileged information from inside CarSpyShots' most prestigious automakers, The CSS Automotive News is proud to debut its Online Edition, wherein curious enthusiasts will enjoy exclusive scoops, rumors, spy imagery, auto show previews, and other breaking industry news. Designers, feel free to use this space to post your ideations, future product plans, debut schedules, and other important information. Curious onlookers, watch this thread for important news from your favorite CSS manufacturers. "If you didn't read it in The CSS Automotive News, then you just can't be certain!" AWESOME MAN!! I know this is gonna be fun! :) Kudos to dsgnr for the idea. I hope it's not too late to debut at the British Motor Show. Everyone got a good laugh in northern London, England yesterday. A large, black billboard was placed behing a paralled-parked Renault Laguna the night before. There was text on it that read " This car and it's environment just don't CLIK. " with the latter four letter word colored lime green. Citizens were confused, thinking a new Smart was being developed, until they saw the brand logo. A small circle divided into four sections, with a red section being pulled out. Bellow the large, humorous text was a another phrase reading " 25 MI South " which was the location of the 2009 British International Motor Show. Our motor show- goers will look out for the logo and the word " CLIK "
Yes, Jordmaniac is back. You can start moaning now. That was spam as well. Source: Road and Track Magazine. News is out that the sports car company Merika of Portland, Oregon will be selling the brands of Burlington and Saxon to an unknown buyer. As well, the company is now changing its name to Mericros and may be changing their style of their automobiles. We hope to see more pictures of the cars soon. We have also heard rumors of a sports car with a 345 hp V8 that will compete with cars such as the new BMW M3 and will have a price range of around $90,000 to be sold here in the United States. What has JC been up to recently? After the Volant and updated Vurig were released to okay, but not great, receptions by the media and the public at the Chicago and Geneva auto shows, the brand has all but dropped off the radar. Their stands at auto shows have been very quiet lately, with no new product introductions since, and only mild engine changes and trim level modifications peppering their press releases. So what happened to the hot new up-and-coming brand? Sources say that the next models on the slate were a $100k+, Ferrari F430 fighter, and a sedan positioned above the Virtu to go against the S-class and the 7er. Concept versions of both were planned for subsequent auto shows but were ditched due to rising gas prices. This has forced JC to rethink its strategy and reposition its focus on economical strategies; this can be seen through the company's new updated motors with better fuel economy, cylinder deactivation programs, and lighter weights. But don't fret if you're holding your breath for new models. JC still needs to use its large Virtu platform on another model to decrease production costs; the aforementioned large sedan and F430 fighter were rumoured to be on the Virtu platform before getting ditched. Speculation states we might be seeing a Virtu-based 6-series coupe fighter, or an even larger Mercedes SL convertible fighter in the pipeline. Rumours are also swirling concerning a smaller, 1-series fighter. But in the immediate future, we will see a facelifted Voltaire and a Vurig H to replace the slow-selling Vurig R.
JC has been a bit sparse with the new releases lately, i've missed your work =( glad to hear you've got some stuff in the pipeline, though. definitely got some stuff going on with montgomery, just deciding which of it to post! Publicity stunt or a tale of a man on the edge? Showgoers at the British motorshow were shocked yesterday, when Clarkman MD went bezerk on the G-wiz stand. Appearing on the stand drunk, the looney Mr Clark took a tree branch to the tiny G-wiz in a scene not dis-similar to that classic Fawlty Towers sketch. Mr Clark was eventually escorted off the stand by security whilst shouting "The Ugly stick, the ugly stick". We are left wondering if this was a pre planned publicity stunt or just the pressure of the automotive business getting to Mr Clark. 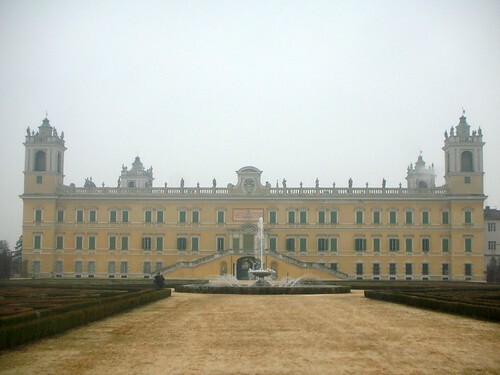 According to some local Italian journalists in the North Italian region Emilia-Romagna an unknown company moved in a former Ducal Palace, also known as "Reggia di Colorno" near Parma. People in Parma say that the head of this mysterious company, which moved in with 500 workers (engineers ?) is one of the ancestors of the Correggio family, who actually built this picturesque palace. Last edited by dsgnr; 07-28-2008 at 12:11 PM.